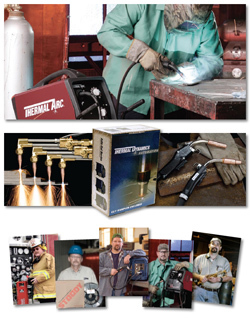 Leverage the strength of industry leading brands with an established distributor network while offering value and quality in competitive market for metal cutting and welding hard goods including: gas equipment (torches and regulators), welding power sources, filler metals, MIG guns and plasma cutting systems. Integrated profile/testimonial print advertising and public relations campaign designed to celebrate skilled craftsmanship of metal working and fabrication to reinforce end-user preference of Thermadyne brands. Tactical elements include brand building marketing communications execution of scheduled calendar promotions, enhanced web/interactive communications, direct mail, trade show participation, showroom merchandising programs, new product launches, improved catalog and product literature. Structure and organization of marketing activities is systematic, focused and targeted with scheduled activities and processes. In spite of economic downturn resulting in sales declines and re-sizing of company in 2009, Thermadyne marketing does more with less and maintains healthy margins. Fine tuning of routine integrated marketing communications in support of branding activity delivers a dramatic positive effect on profitability and improves effectiveness and power of well-planned product line management.